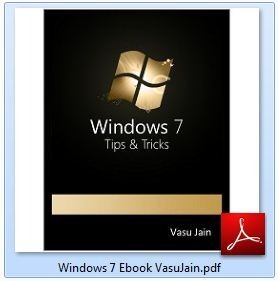 It gives me immense pleasure to Launch an Ebook on Windows 7. The book is titled “Windows 7: Tips & Tricks” and as the name suggests its a compilation of one of the finest Tips n Tricks about Windows 7. You can use them to enrich the Windows 7 Desktop experience of yours. It contains more than 50 Tips and tricks and an added bonus section for Windows 7 Applications. 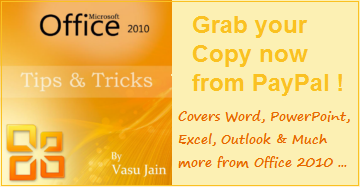 You can download the eBook for free from WindowsVJ.com. Really like the book. Thanks.bye bye. GR8 GR8 GR8 BOOK THANKS FOR VASU JAIN …………. The Windows 7 Tips and tricks book is worth the price. I’m not really a fan of Windows 7. I’m having a terribly difficult time adjusting and adapting. My friend Puneet Bajaj actually suggested this book to me and seems to think it will help me. Glad to see that it’s still available and that you’re receiving such good feedback. I’ve got my fingers crossed that this will shine some light on my problems. Thanks! Thanks for this book. I just bought my Windows-7 laptop. I have a suggestion: Could you please add page number in the index for your Windows 7: Tips & Tricks Ebook? Nice tips from the few chapters that I read of the start. Been using Win7 at work but could use some reference with tips and quick links as I like so much on keyboard shortcuts. Wow!I found your blog via ws sign Google and I just wanted to say that I believe your writing is just stunning! Thanks again with regard to providing this content for free. Maybe you could write next articles referring to this article. I want to read more things about it! I want to thank the blogger very much not only for this post but also for there previous efforts. I found this blog to be very interesting and I will be coming back for more information. This comes in handy when I’m learning the Windows world from Mac user. Last time I used Windows XP at home so I should really update my knowledge of this before windows 8 comes. The download does not work. Tried on two different computers. it is in fact for a lot of other visitors… try some other browser or Network. Still if not possible i will mail you. 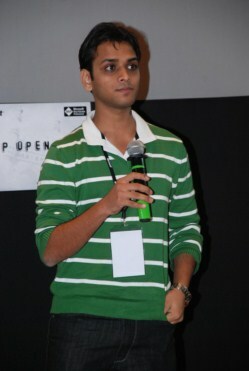 Thank you very much Vasu for your comprehensive work and willingness to share it with us. All the best and kudos from Denmark, my home country, and Venezuela my second homeland. Such an innovative idea. Absolutely love it!